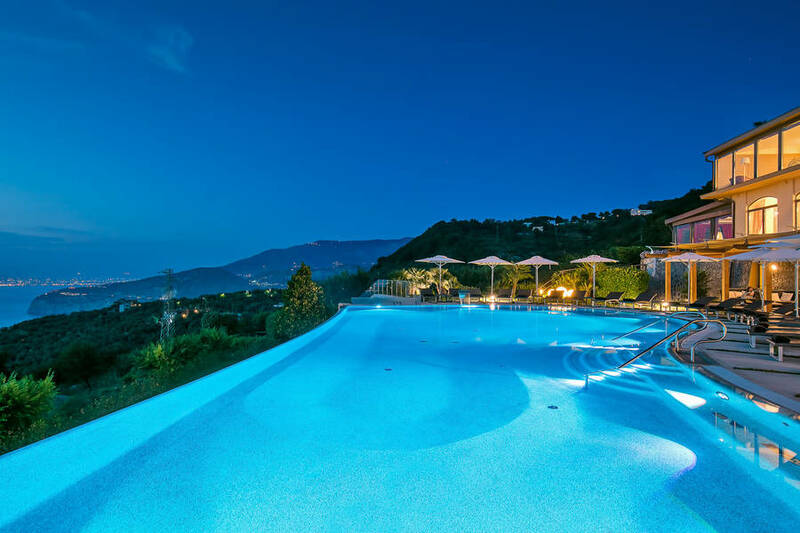 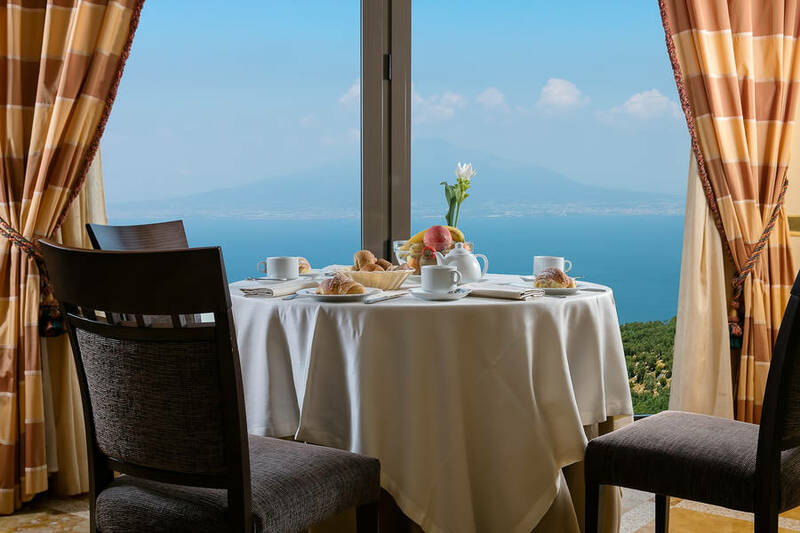 Savor the timeless beauty of Italy's southern coast from the Bay of Naples to the Bay of Salerno from your room's private balcony or from the infinity pool at Grand Hotel Due Golfi, the four star luxury hotel in Sant'Agata near Massa Lubrense...the heart of the Sorrento Peninsula! 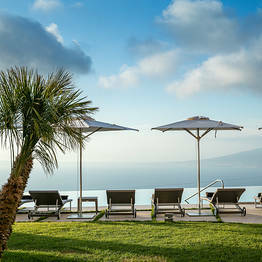 Unwind in this paradise on earth! 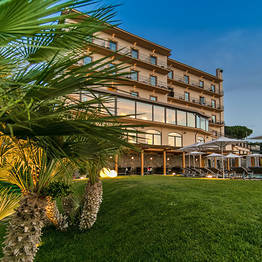 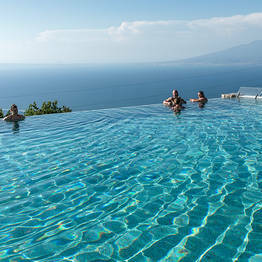 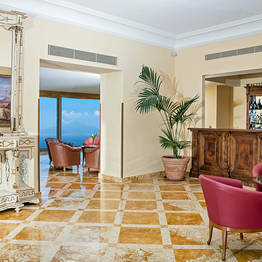 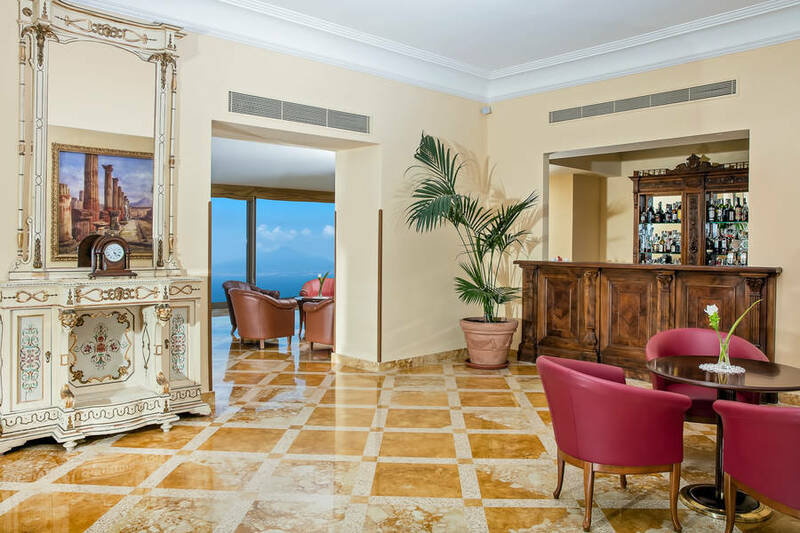 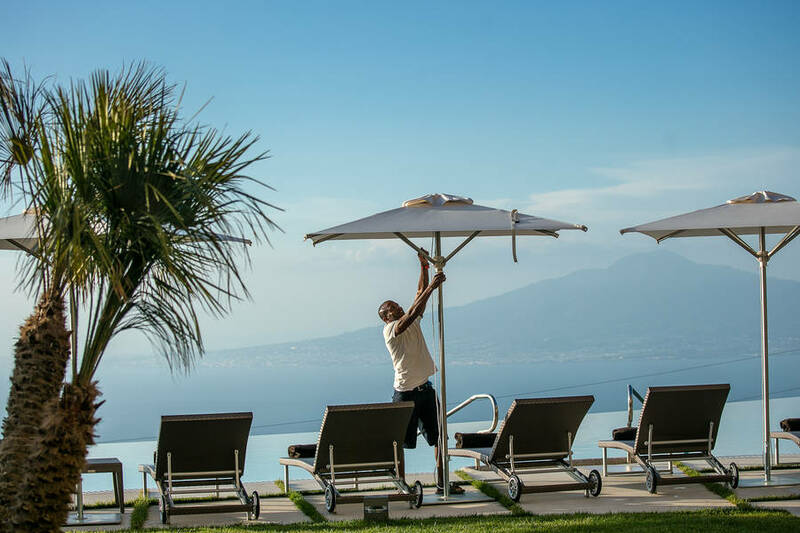 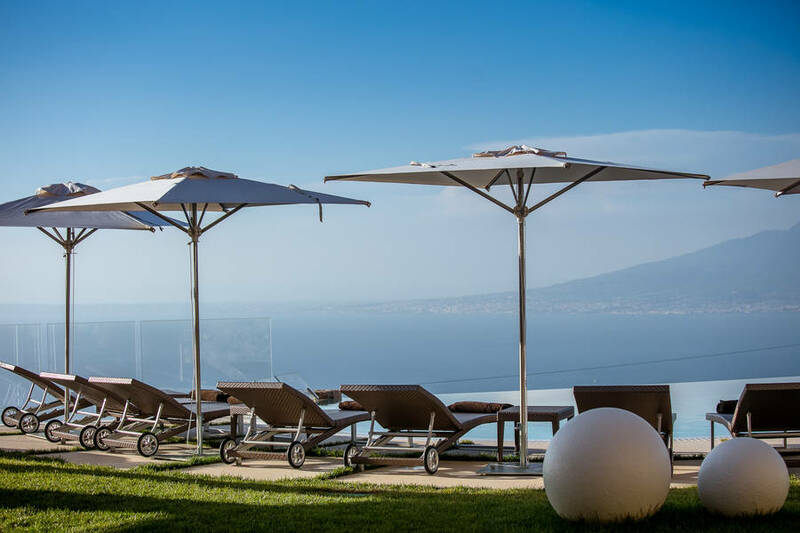 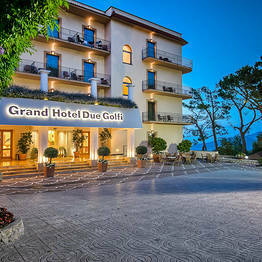 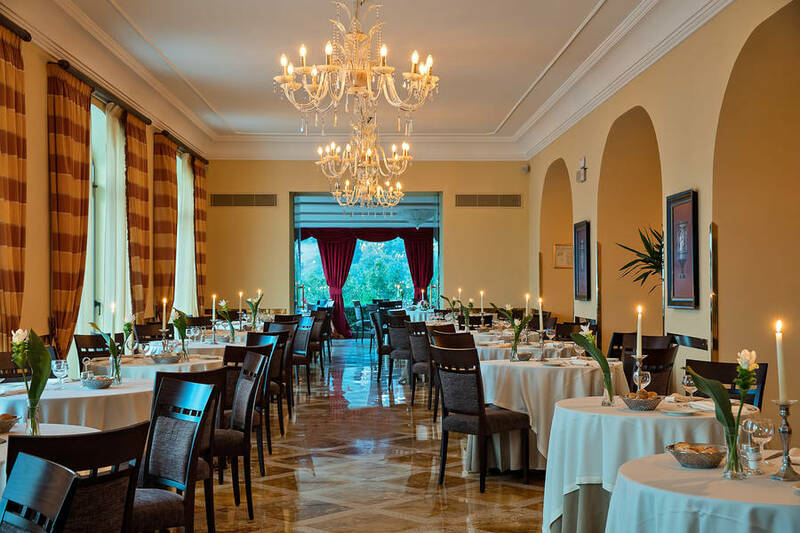 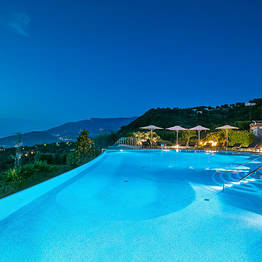 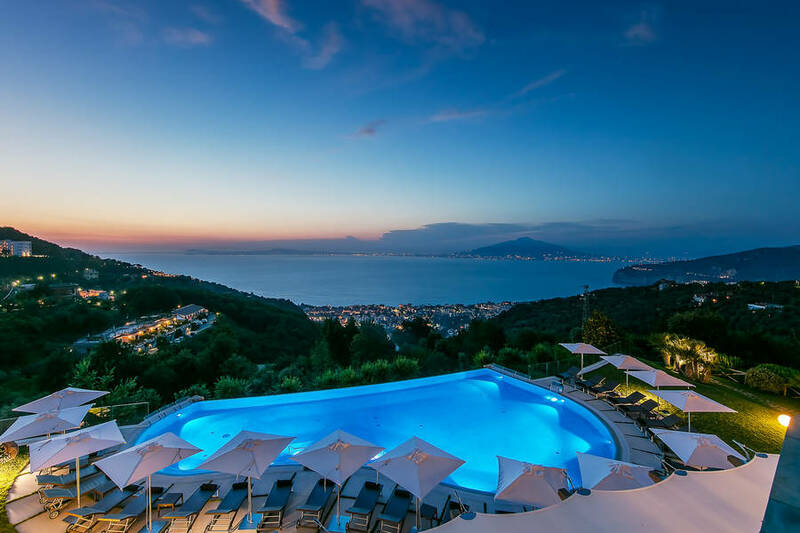 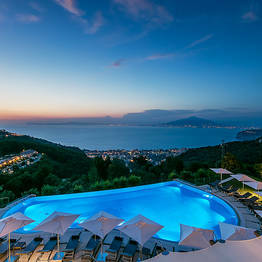 Grand Hotel Due Golfi has one of the coast's most stunning views of the Bay of Naples, the Sorrento Peninsula, and Mount Vesuvius from its plate glass windows in the hotel lounge and restaurant, from the new outdoor garden terrace and infinity pool, and from the sea view guest rooms. 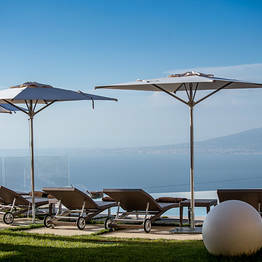 You'll be treated to heavenly views day and night from wherever you may be. 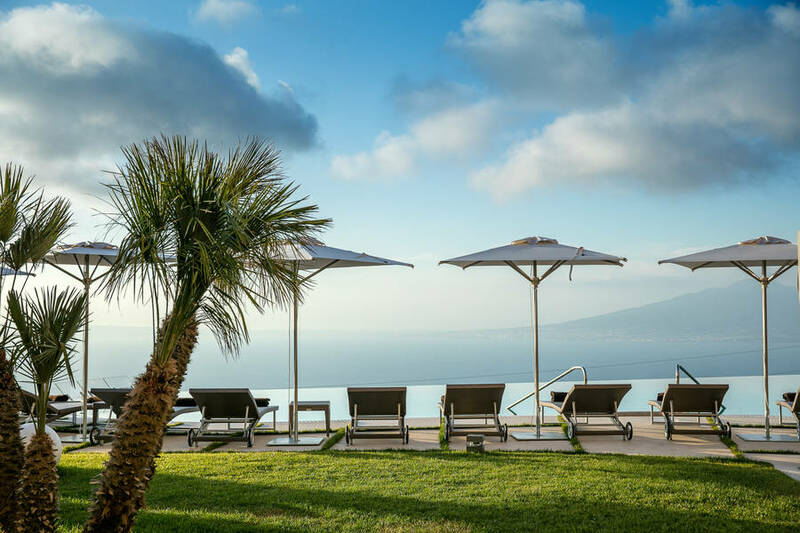 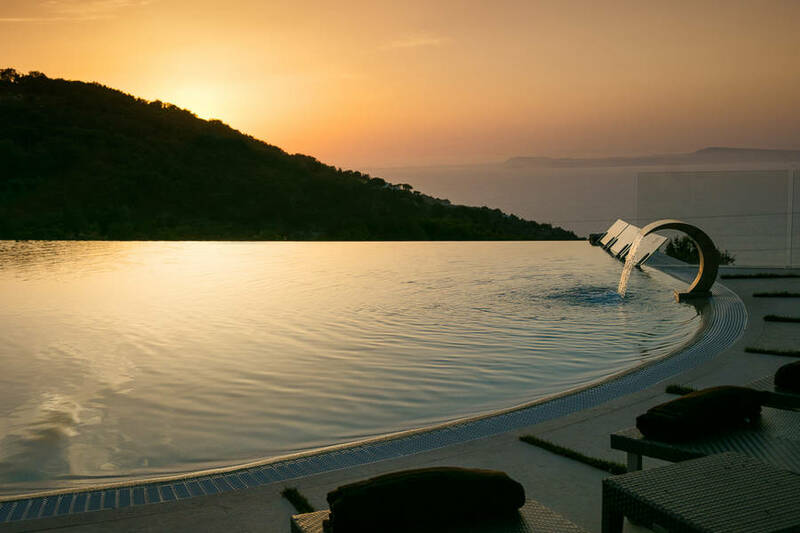 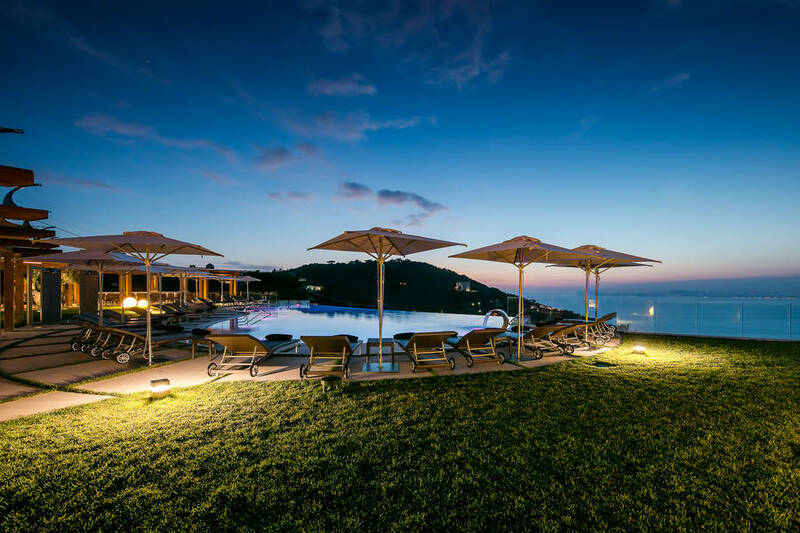 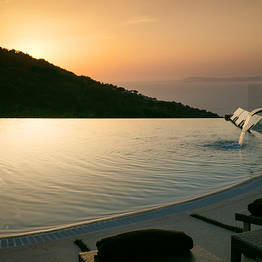 The newest addition to the Grand Hotel Due Golfi is its spectacular outdoor infinity pool, where guests can unwind with the blue skies above and the sparkling waves of the Mediterranean below, cocktail in hand. 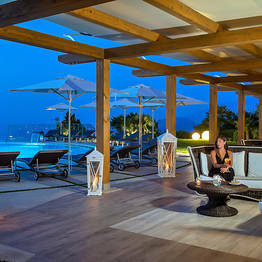 Relax poolside or under the garden gazebo and feel your cares fade away! 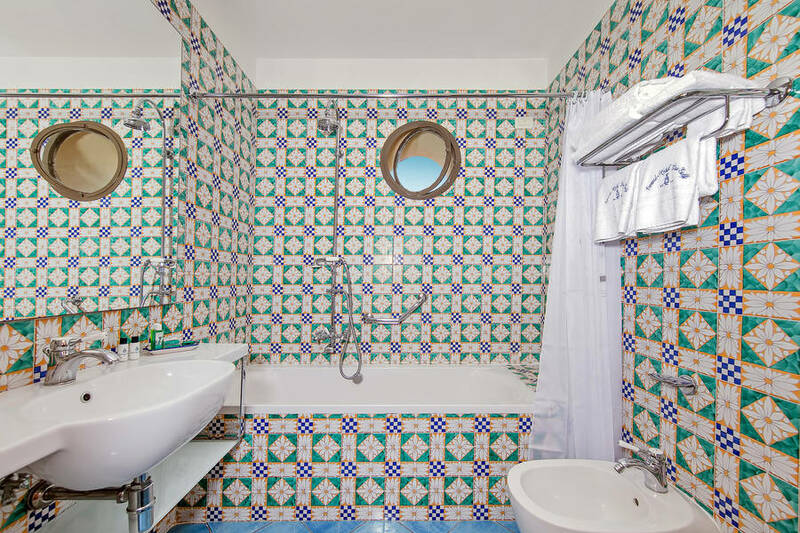 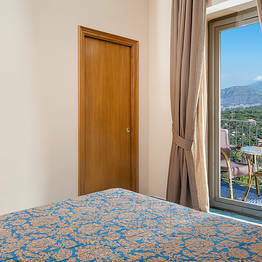 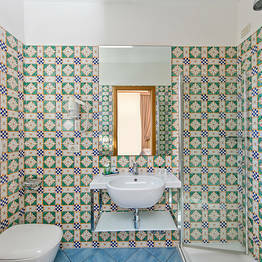 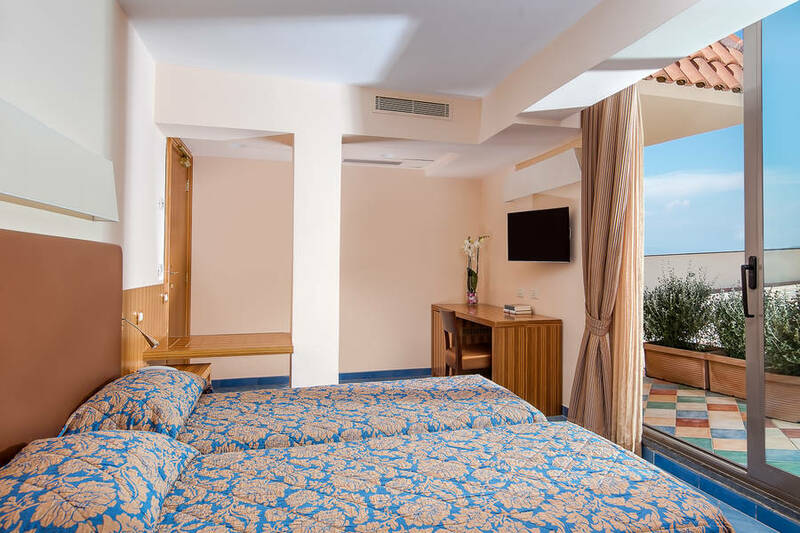 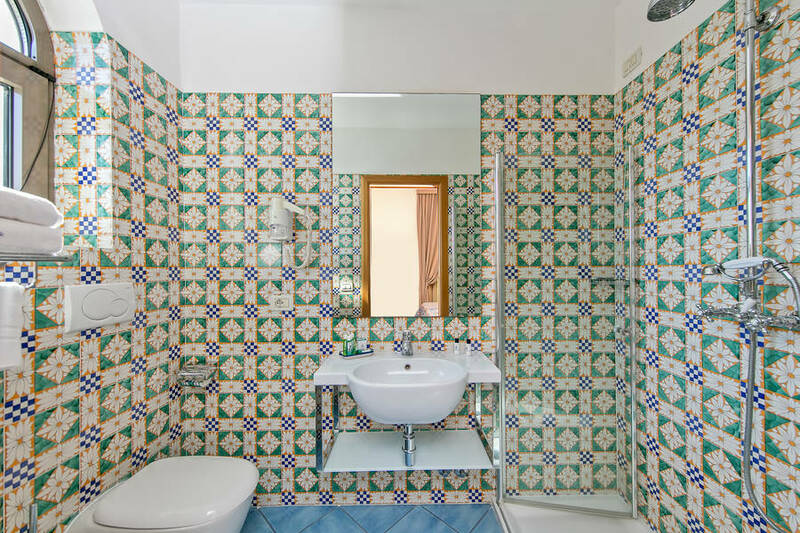 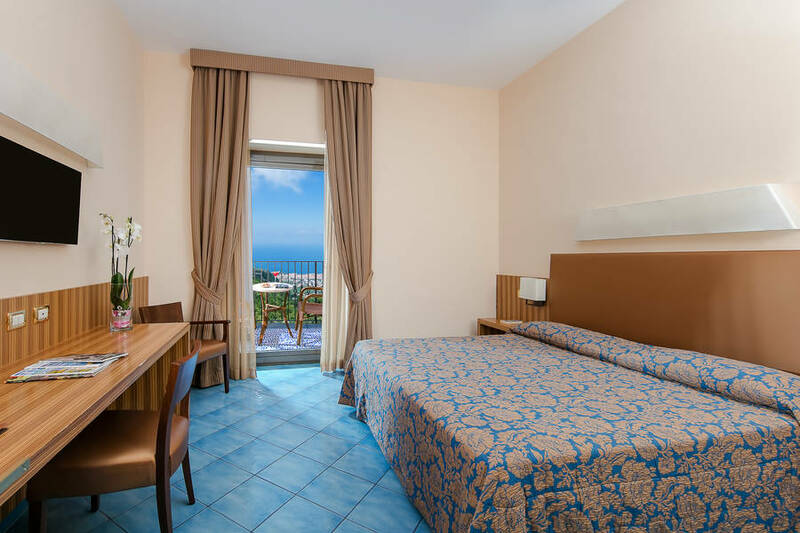 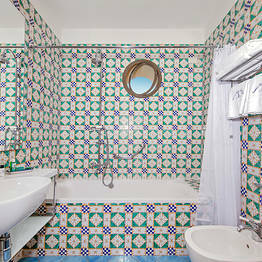 Settle in to your bright and spacious room, measuring from 15 to 21 square meters, with its private balcony and bathroom tiled with traditional Vietri majolica. 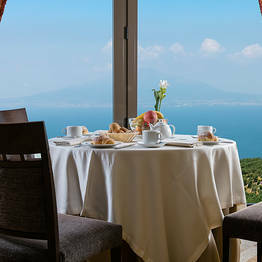 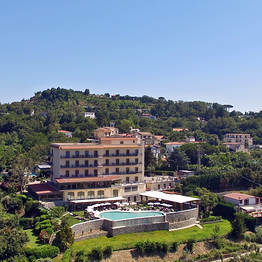 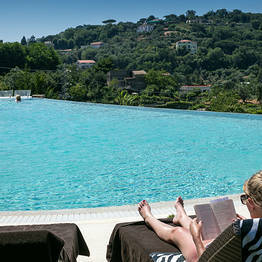 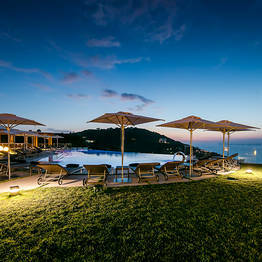 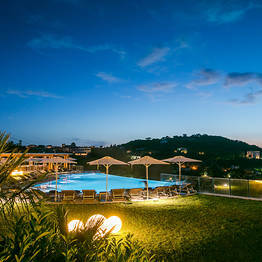 Each room at Grand Hotel Due Golfi boasts a private balcony with a sea or garden view. 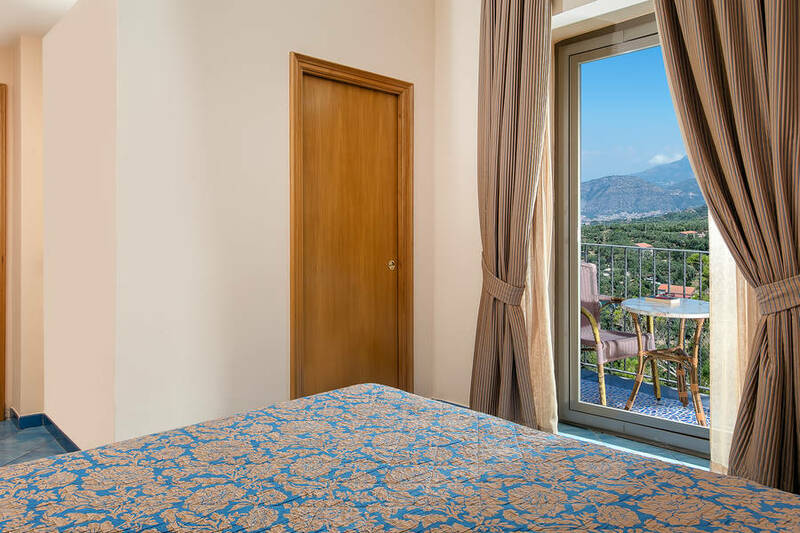 Heaven is just outside your French doors! 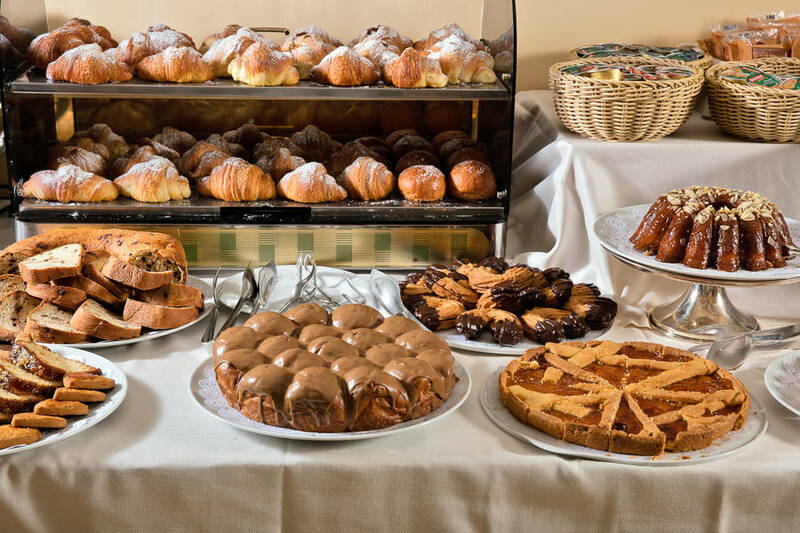 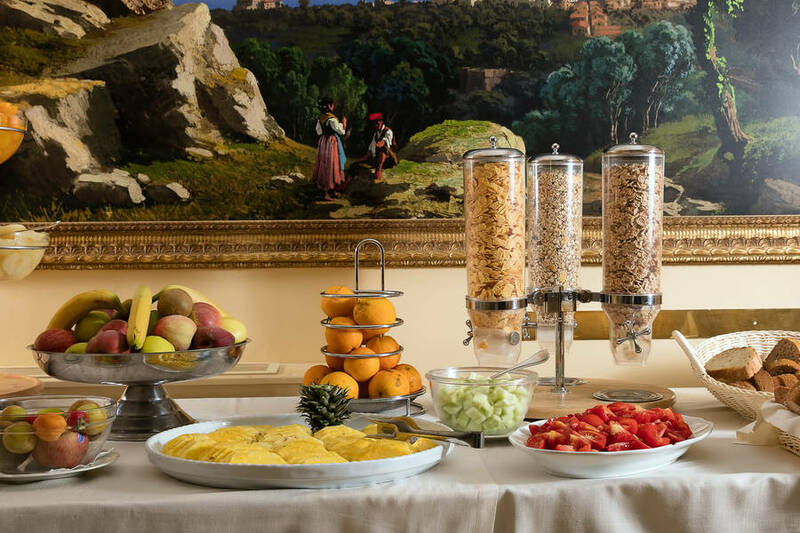 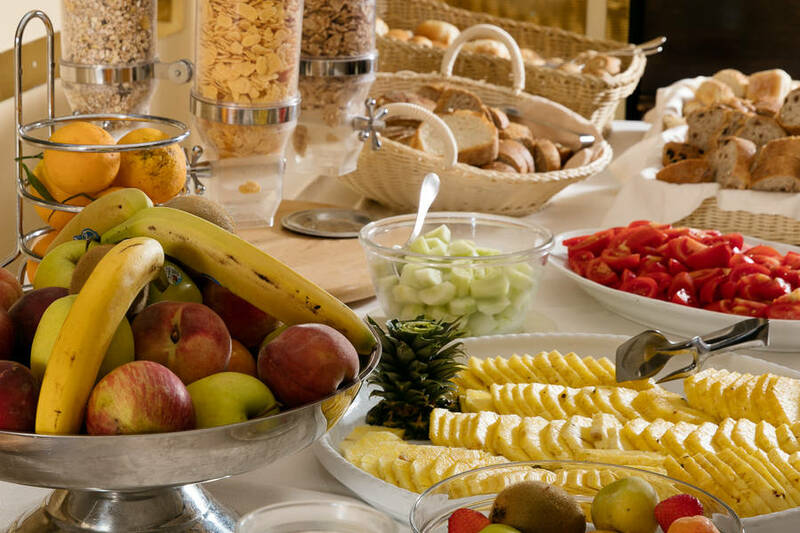 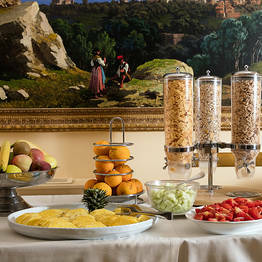 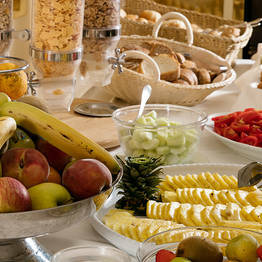 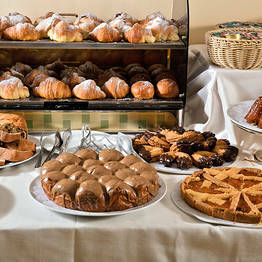 Begin each day right with our Continental breakfast served in our dining room overlooking the sea and featuring both sweet and savory selections and coffee prepared to order. 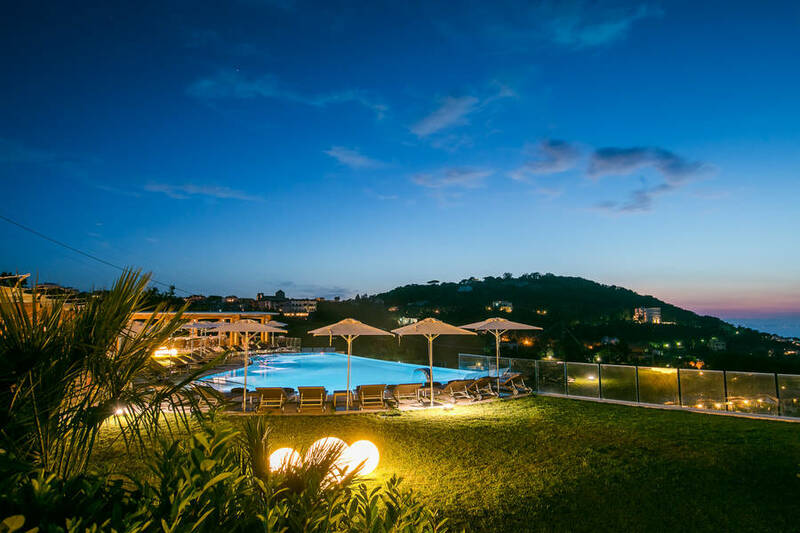 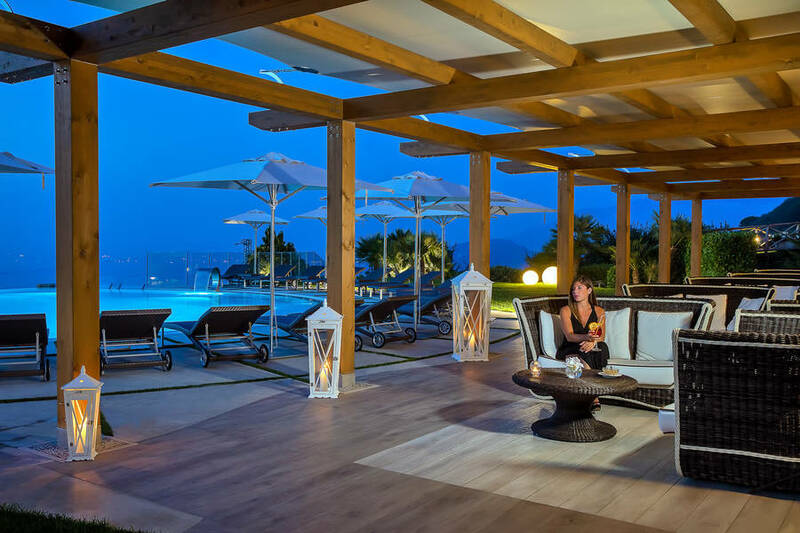 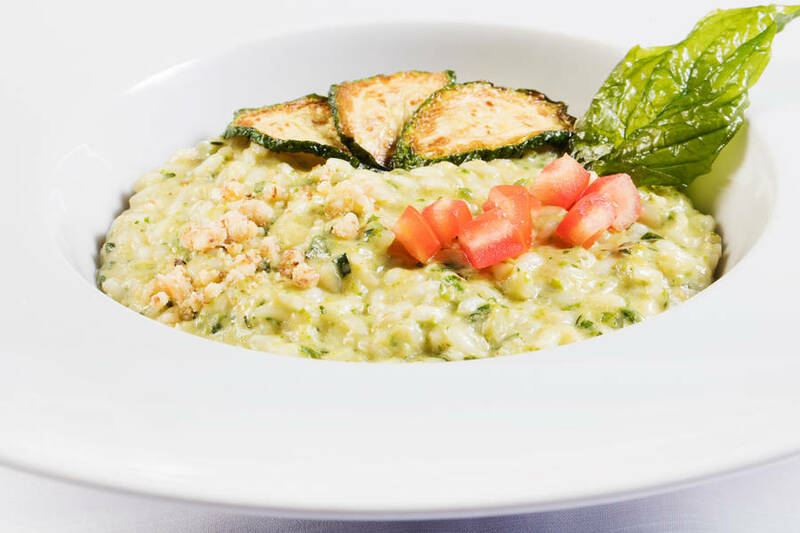 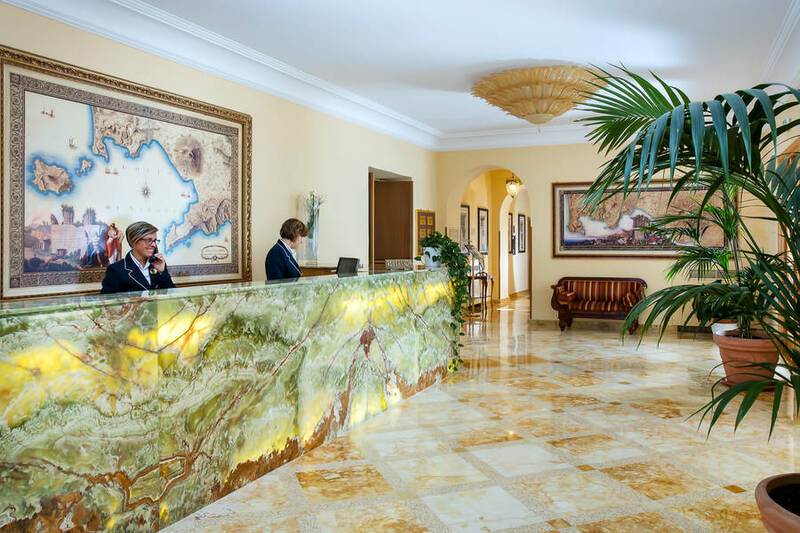 Your reception at Grand Hotel Due Golfi will be a stunning success, either in one of our indoor reception halls with a view or outdoors on the Terrazza L'Incanto pool and garden terrace. 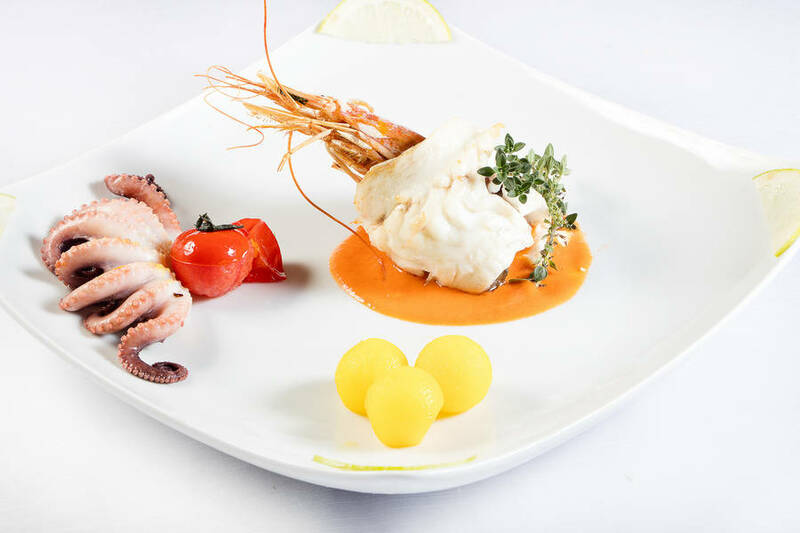 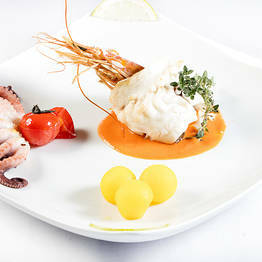 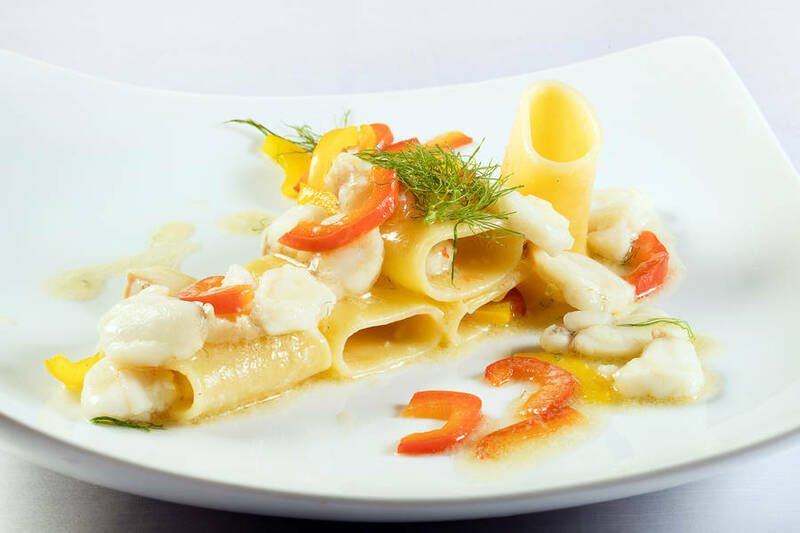 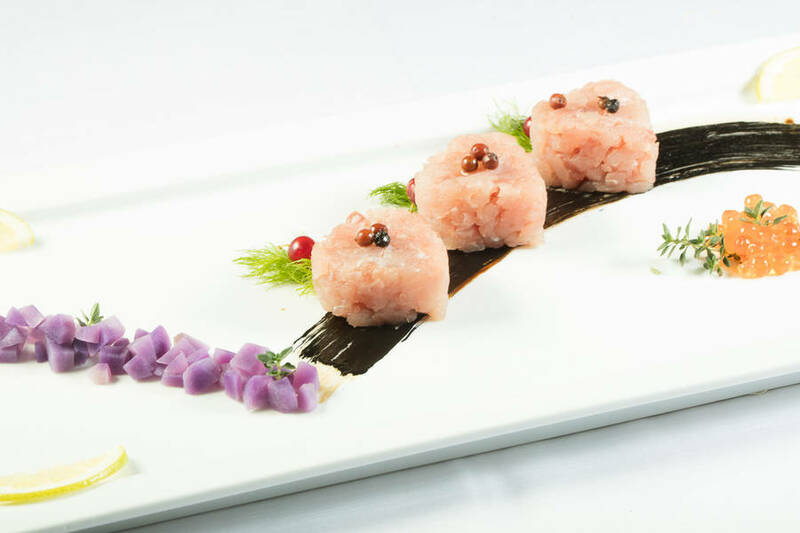 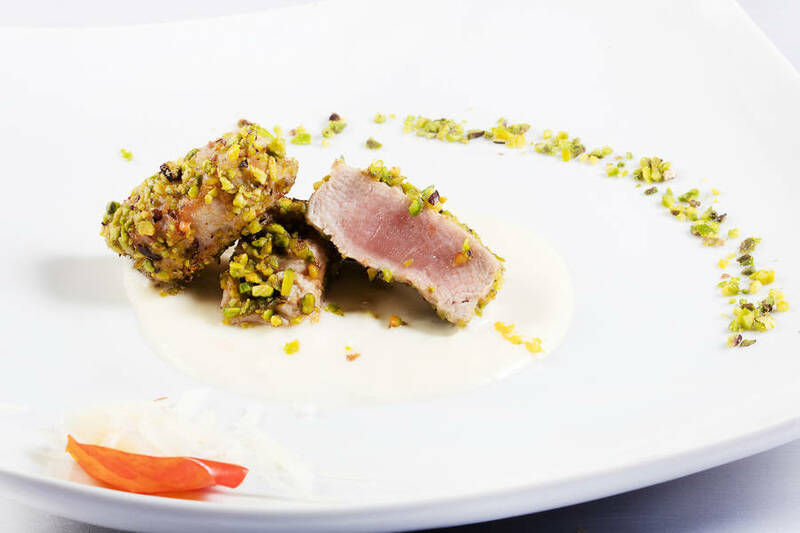 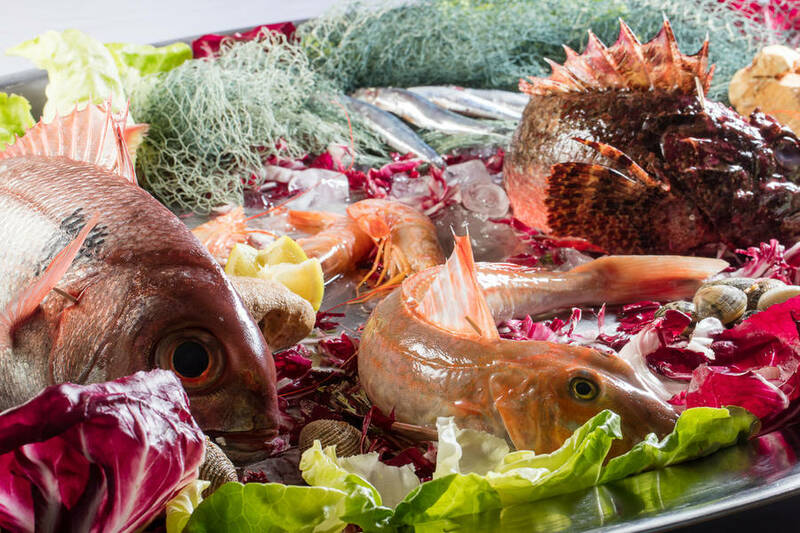 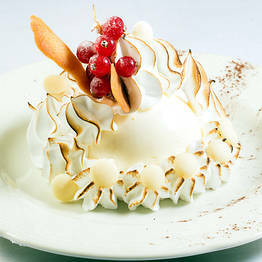 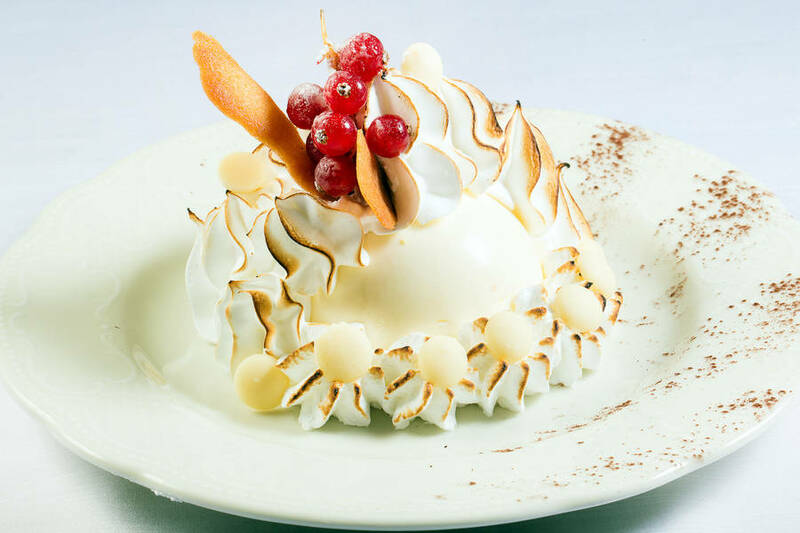 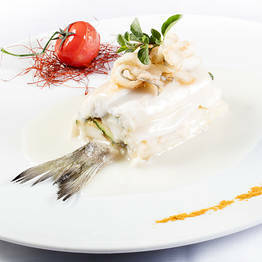 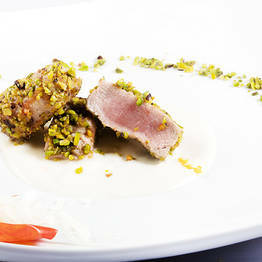 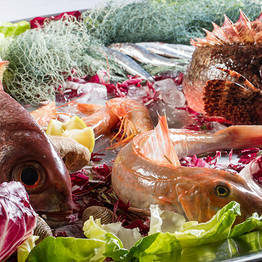 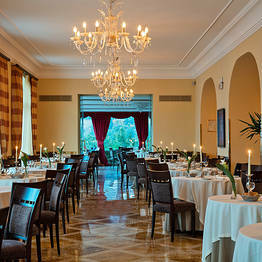 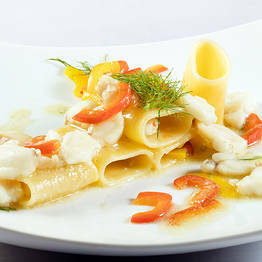 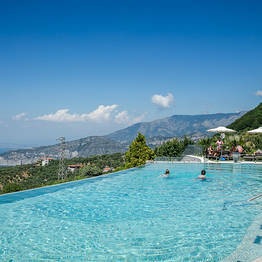 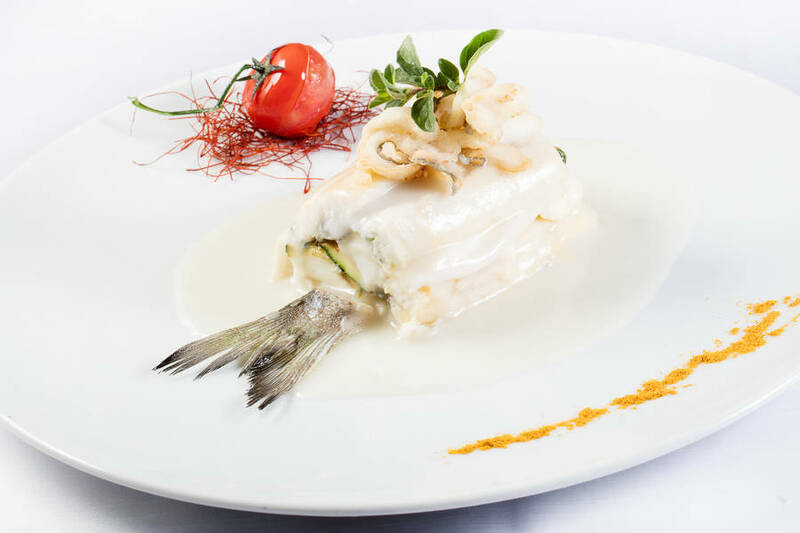 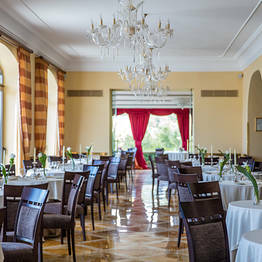 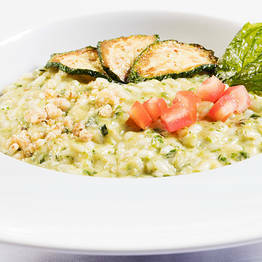 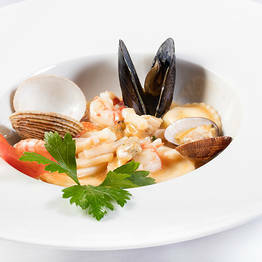 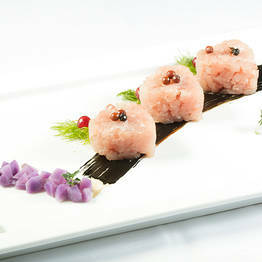 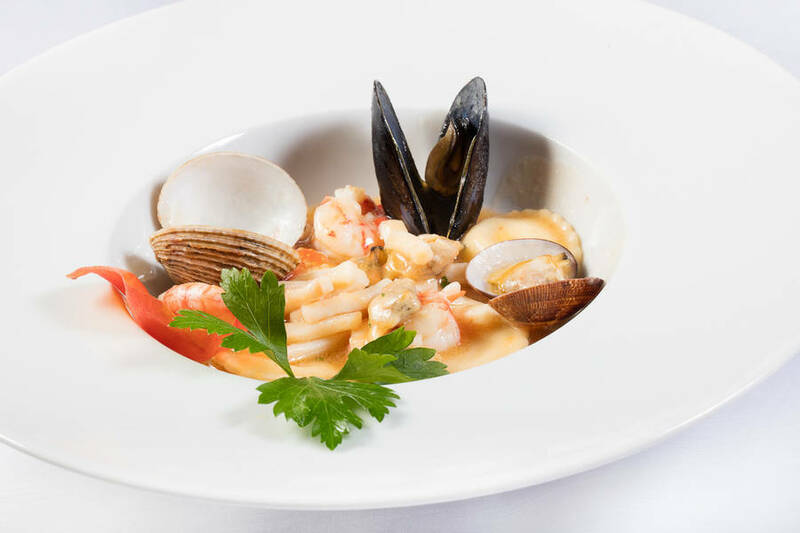 We can accommodate up to 250 guests outdoors or 150 guests in the Sala Rubino with its panoramic veranda. 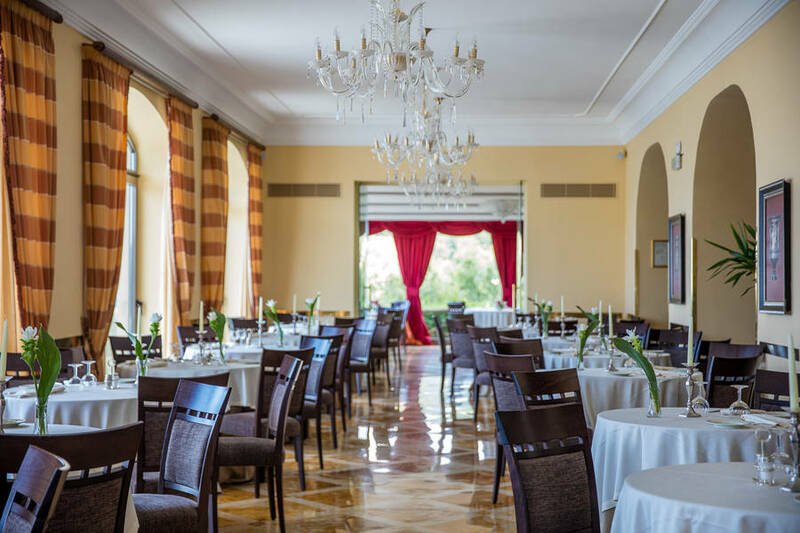 Paola, our in-house wedding planner, will guide you through the planning process and help you with every detail from the decor to the menu so your special day is customized to your style and taste. 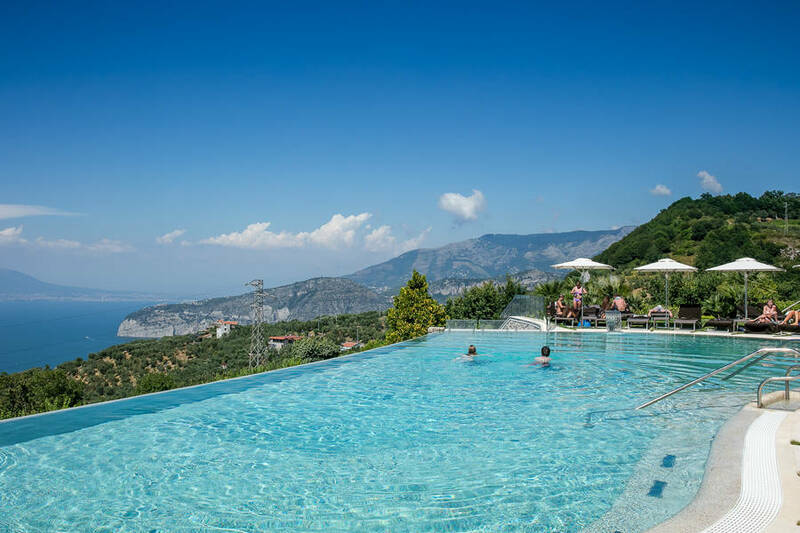 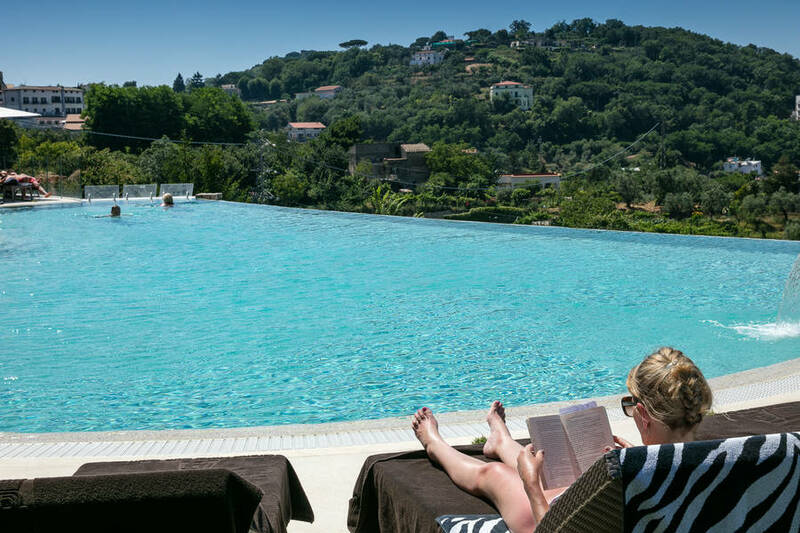 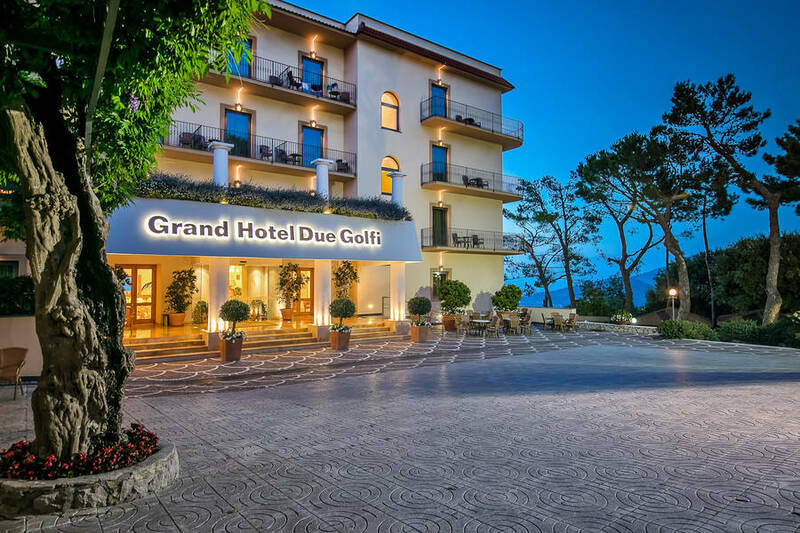 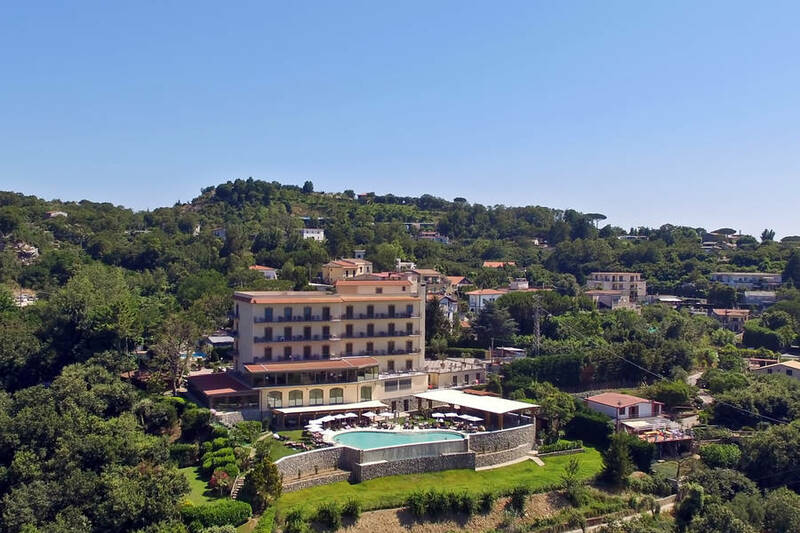 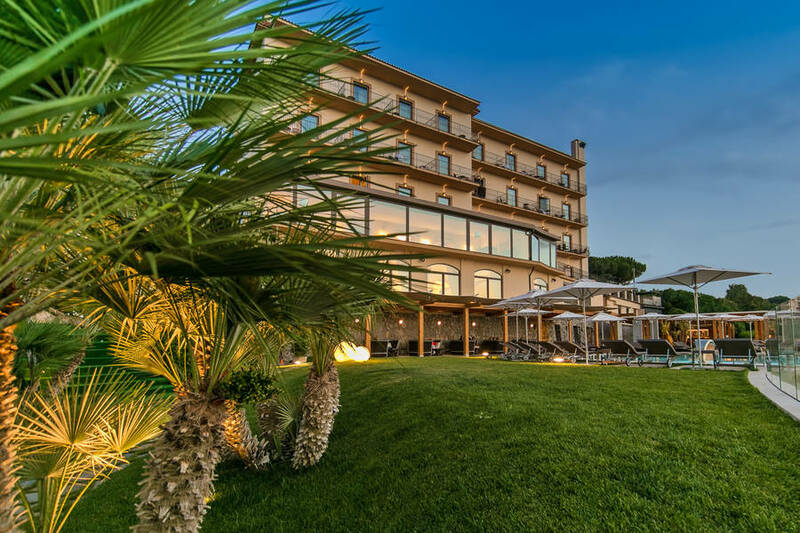 Grand Hotel Due Golfi is perfectly located for exploring the most beautiful spots on the Sorrento Peninsula and Amalfi Coast, with easy access to the main roads while bypassing the heavy traffic of Sorrento. 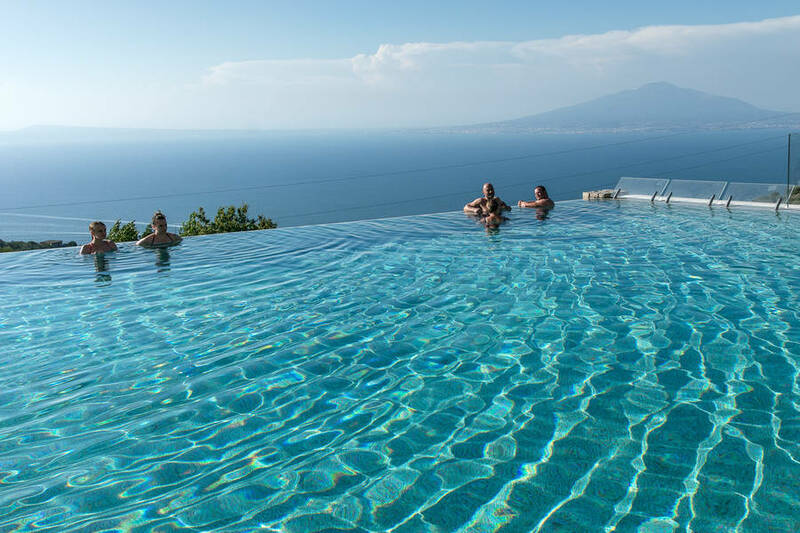 Our concierge service can assist you in planning personalized tours and day trips to the most famous nearby sights: Sorrento, Amalfi, Positano, Ravello, Naples, and Pompeii. 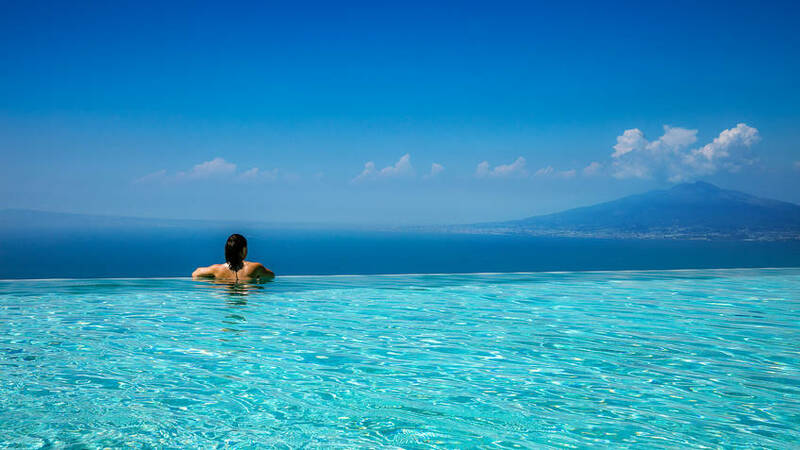 Just ask, and we'll help you plan the vacation of a lifetime! 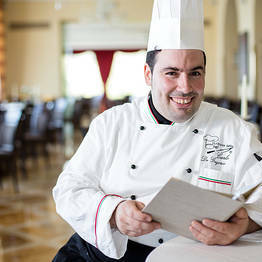 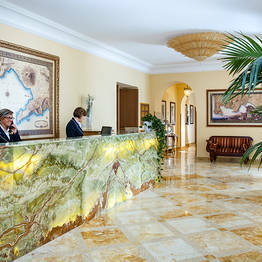 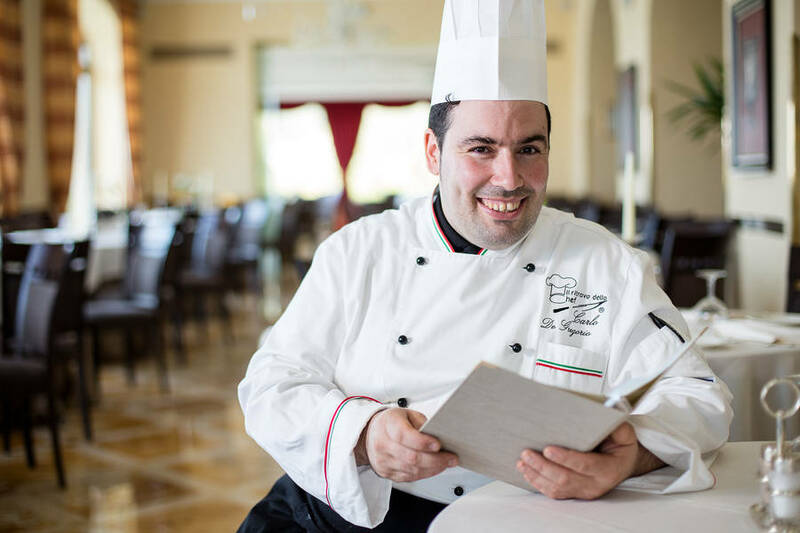 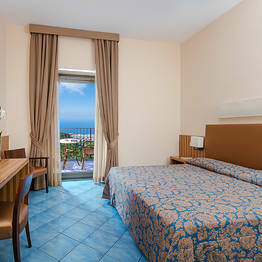 If you are not travelling by car, you can use the free shuttle service to and from Sorrento for hotel guests.